I am not sure what this world is coming to when a good samiritan gets sued. I would hate to think that in order for someone to help another human being, they would have to check with local and state laws as well as have them sign a waiver of liability before helping someone in distress. Being a nurse, I always felt I was somewhat protected from lawsuits as long as there was not an exchange of money. Obviously I was very wrong. Here is 2 week old Paula. I saw this picture and felt I had to share with all of you. Enjoy! I can't believe we had snow this week. Again, I was reminded why I do not leave where it snows regularly - I can't drive! I am terrified to drive in snow, partly because falling snow while driving makes me dizzy and partly because I am constantly afraid I will end up in a ditch. I can't believe my baby is fixin' to be 14 years old! Where has the time gone? For his party, Dalton decided he wanted a couple friends to spend the night and watch movies and play video games all night long. 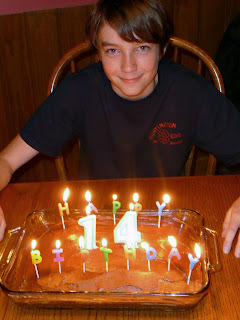 For his birthday dinner, Dalton picked hamburgers on the grill and chocolate cake with chocolate and peanut butter frosting - YUMMY! They had a really good time! I am really surprised Bush didn't take off his own shoes and throw them at the journalist being the tactful president that he is. I bet it crossed his mind, though! This is too cool! I can't wait to take the girls. The second picture was a couple of Saturdays ago. We were returning from a pig auction and I had Al pull over so Callan and I could take pictures. We just don't get sunrises and sunsets like these very often so I thought I would share my pictures with you all.